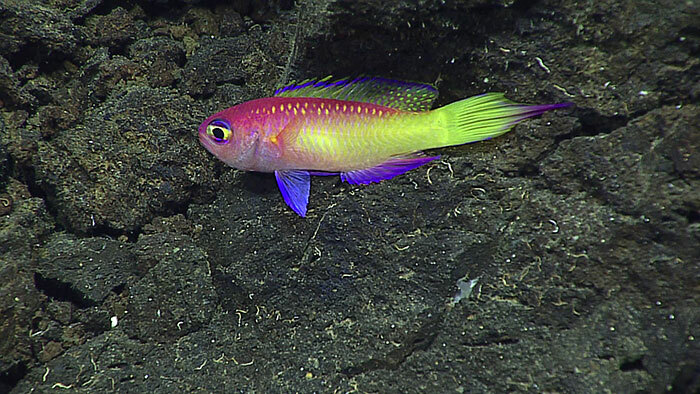 The deep reefs of the West Pacific have revealed yet another brilliantly colored piscine jewel with the description of a new species of groppo, Grammatonotus brianne. 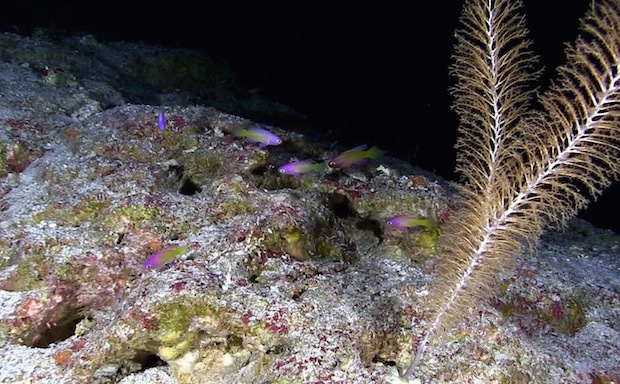 This small group of mesophotic basslets is typically found at depths in excess of 100 meters, making them a rarely seen group in the wild, and one which has hardly ever been kept in captivity. A new species of Grammatonotus (Splendid Perch) collected from 147m during the 2014 Philippines Biodiversity Survey conducted by the California Academy of Sciences. This dive included Bishop Museum (Honolulu) divers Richard Pyle, Sonia Rowley, and Brian Greene as well as CalAcademy divers Luiz Rocha and Elliott Jessup. 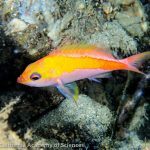 Brianne’s Groppo was discovered in the Northern Philippines back in 2014 as part of an effort to survey the marine fauna of the Verde Passage and was found at 150 meters. 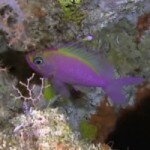 The video above shows the moment when this fish first made its way up to the surface. Thus far, it has only been reported at this one location, though it no doubt occurs widely in the West Pacific. In total, there are 8 described taxa in the genus, with a few more yet awaiting nomenclature. For such a small group, they are a surprisingly diverse lot morphologically. The shape of the caudal fin varies wildly across these species, with some having a relatively truncated fin… others lunate… the Japanese G. surugaensis sports numerous terminal filaments… and a few are now known for their lanceolate derrière. 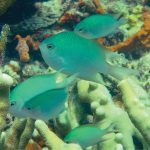 All of the species appear to be rather colorful, coming in neon shades of yellow, pink, and purple that give these fishes a sort of retro 1980’s vibe. 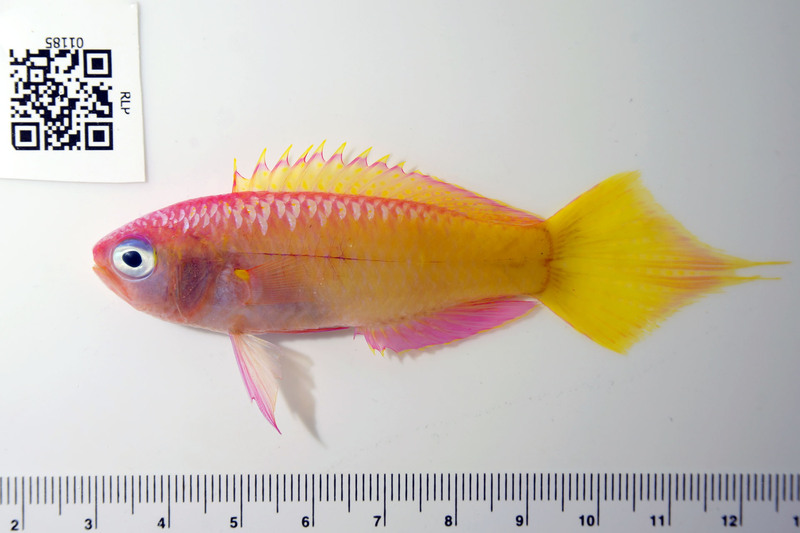 While a couple other species are known from the Coral Triangle, the closest relative of G. brianne is likely an undescribed fish from Micronesia that sports a similar tail shape and equally bright hues. 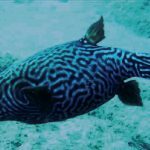 That fish has been spotted in the Mariana Arc by the recent Okeanos Explorer expedition, as well as from Pohnpei, where specimens were again collected by Brian Greene from a similar depth of 150 meters. 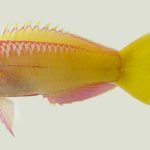 Obviously these fishes, gorgeous though they may be, are unlikely to ever make their way into the hands of aquarists, but it’s possible that the divers at RVS Fishworld, which recently collected a newCirrhilabrus at fairly considerable depths, may yet happen upon this fish. 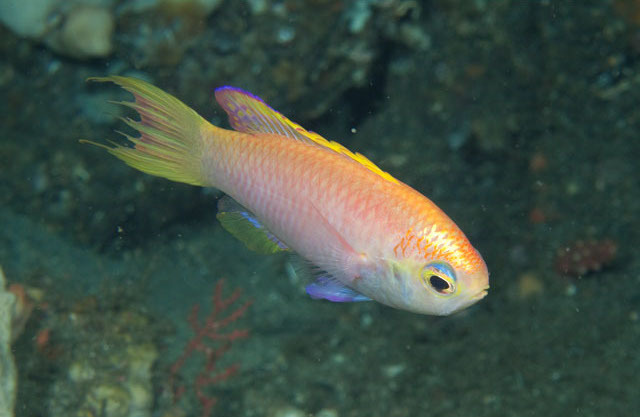 There is a record of G. surugaensis having made its into the Japanese aquarium trade, where it retailed for $2000. That species seems to be a bit anomalous in that specimens have been observed as shallow as 50 meters with some regularity. Brianne’s Groppo is named after Brianne Atwood, Brian Greene’s better half. She now joins the illustrious ranks of other wives and girlfriends that have been immortalized as fish, such as Halichoeres claudia (after Luiz Rocha’s spouse) and Cirrhilabrus joanallenae (after Gerry Allen’s wife). Chivalry is not dead.